Before you continue to the next paragraph, consider whether you belong to the first category where you know it to be self-evident that there are are super-physical realities beyond our familiar 3d-world …. you may be the mystical type or maybe the darwinian type 2 who asserts natural selection proceeds according to altruistic impulses, where the weaker member of a species receives altruistic help from the fitter members of the species where the law of freedom states that we all have the freedom to think, speak and act within the contexyt of giving everyone else that same right according to the just laws of the land. or you may belong to the next category , a darwinian type 1 character, who is satisfied with the theory of biological evolution, excluding the possibility that there may also be a creditable theory of consciousness evolution. If you are in this camp, the 3d-biology-only camp then jump to here with your mind wide open to new 3d-possibilities…. otherwise continue to the next paragragh with your mind wide open to new super-physical possibilities. Switch to imagination-mode and go back in time and imagine you have been part of the team to have built the pyramids of the giza plateau…the celebration speech is underway by the chief-architect..and you are looking forward to a well deserved vacation exploring down stream of the nile. “welcome, fellow team members of this most ambitious project, our pyramid triad is now complete, well done honored and beautiful team, all the food and drinks are prepared for our celebrations. The schedule is that at noon, the new LEO epoch starts just as our watchful sphinx gazes at the point where LEO takes over center-stage from outgoing VIRGO-LIBRA. At the same moment as i cut the ribbon in front of the entrance on stone level 19, we will observe a mediatation lasting 4 mins 32 seconds and tomorrow we will repeat the mediation at exactly noon again, an interval of 432,000 seconds. Therafter our vacation starts..
That gives me 30 mins for my short address and time for questions and another 15 minutes to make my way up the 19 stone levels for the ribbon-cutting ceremony. Today we continue in the footsteps of our ancestors, the astronomer-toltec-mayans and their 5125 year calendar. Many atlanteans today observe the 12 signs of the zodiac, but we the pyramid-achitects still adhere to 10 signs where aries-pisces are still merged at #5 and virgo-libra are still merged at #10. This fact goes to explain our calibration of epochs lasting 2,562.5 years, 10 of them making up one precession of the eqinox. Refer to your hand-out sheets of papyrus, where today is indicated by the large symbol leo and you will be able to follow my best forecast for the future. It’s rare we can forecast more than 30 epochs ahead, so this is as far as i can look ahead with any kind of accuracy…. 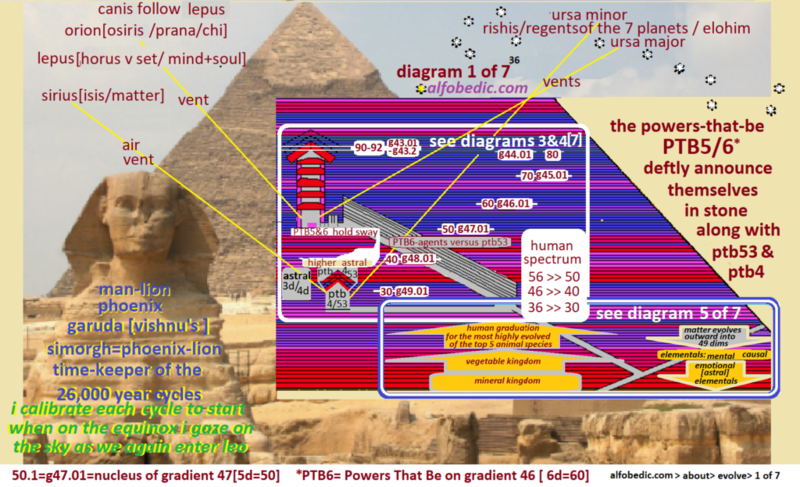 We designed the main giza pyramid to encode in granite and limestone, the mathematical laws of nature and the cosmos, including our 432,000:1 scaled model of earth, its speed of rotation [1000 miles/hr east], its orbital speed [68,000 miles/hr west], the speed of our solar system towards Hercules [average 67,000 miles/hr in a line inclined to the plane of the Ecliptic], the speed of light, √2 [pythagoras’s constant], w[omega constant], m[gravitational parameter], e[axial tilt], p, j[golden ratio] , 1/j [inverse of the golden ratio] among others, and also the mathematical constants of human interaction, including the 49 dimensions and their 7 sub-dimensions, the gradations of downward evolution and the gradations of upward evolution and so much more. We dedicate this 8-sided monument to our guardians and mentors on dimensions 28-42 and leave it as a trusty message for future generations not only to decode but also to apply the laws therein discovered. 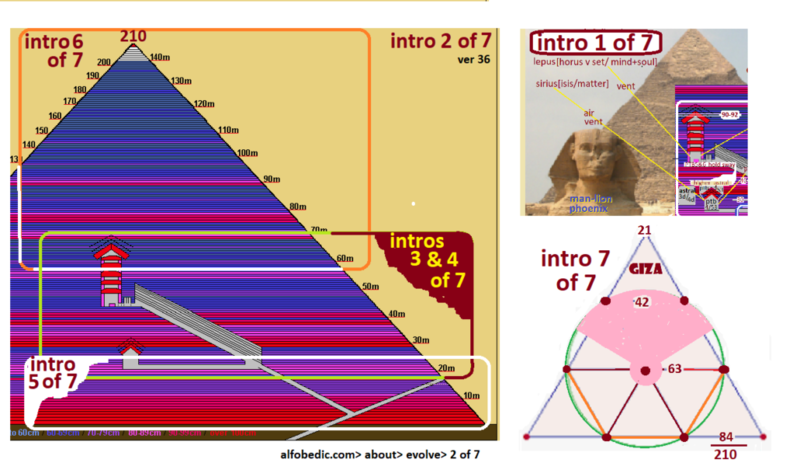 today is the start of precession taht we will call giza zero, starting off another new epoch of LEO. What makes this leo so special is that we are forecasting ahead 30 epochs and so we in effect calibrating a new major cycle to last 77,000 years minus the 2 overlap periods of 62.5 years each. That is really the upper limit of how much we can forecast ahead at any one time , because from experience there are just too many unknowns when going beyond the 77k time span, and as we all know we must respect the law of sevens. We atlanteans are poised here today, 20 epocchs before the next pole shift, which means this civilization of ours will be recycled onto the ocean bed with precious few traces remaining, but our giza pyramids and its sphinx will endure. We have designed it such that no human scribes in the meantime can permanently distort our message and it has been designed to withstand the upcoming pole shifts, tzunamis and earthquakes. As you would expect we have covered all our bases and look forward to seeing the message gradually and methodically decoded when appropriate ..
5 epochs after the pole shift, and the final demise of the last remnant of atlantis, will be sent a master mathematician-philospher extraordinaire born on one of the greek islands next to anatolia [aka turkey] and he will gather around him 400 of the finest souls – male and female to lay the foundations of so-called western scientific civilization. After this golden age [approx 400 earth years] of this aries-piscean epoch [precession giza #2 ], the greek language will be trimmed down from the heady 150k words to a basic working vocab of just 40k words and then starts the silver consolidation phase of 300 years. at last, we will arrive at the beginning of the first overlap period, 62.5 years before the official start of the next aquarian epoch and then for the first time in history, will an adept be allowed to make available to the general public, the erstwhile secret knowledge. Those pictures of the atom due to be published by a most eminent new-yorker shortly after 1875 CE means another celebration … yippee no more need for those contentious secret societies. But we live in the age of duality and it must be conceded that the powers-that-be working on 4d and the lower 4 levels of 5d will tempt many humans of the day to give up on self-improvement and just give in to their emotional impulses. These PTB’s on the lower realms will insist on abusing their knowledge to violate the rights of human kind and tempt their senior minions to store up wealth and power for themselves. As we know from our design those humans stuck on the lowest 2 .5 mental levels symbolized by how far the astral chamber roof extends upwards encroaching onto the fledgling mental domain. Those humans who are also still stuck on the lower emotional levels are the most vulnerable to the clutches of the lower PTB’s. It’s expected that a rare as rare can be talent will appear in sweden and expand on generation #3’s atomic work by introducing the long-lost mathematical notation that was the linqua franca of the aformentioned generation #1 of decoders. This swedish giant is not one to mince words and so we can foresee a lot of resistance coming from the so-called authorities. But the seeds have been sown to be picked up 62.5 years after his first publication by the 4th generation of coders and decoders of our series. [2013 BCE]. and so we arrive back almost at our starting point the auspicious alignment with the mayan calendar. Lo and behold if all goes according to the forecast, the mayan forecast will create quite a stir in the public domain. The also known as the 20-13 calendar – so-called because it’s made up of 20 treks of 13 days each. If the mayans are right then their reset should happen on 2013 CE. Even as this generation #4 of decoders make giant strides in the decoding process, not more than 1% of the visitors who walk in awe, around this monument of ours, are expected to be triggered to venture inside to inspect our even more awesome handiwork. So much for the urge to look within!! [dear generation #4 of decoders, we have left you an important message in stone precisely callibrated to explain why your governments, your empires, epochs and your consciousness-challenges get recycled in 26, 260, 2,562.5 and 25,625 years cycles within cycles. WELL, BACK TO THE NOW MOMENT … dear team of today’s generation of pyramid builders, as you have surmised from the foregoing words, there will come those 4 decoding generations in turn, and especially the 4th of the series will be able to use our mathematical notation and formulae to help prepare for the upcoming sub-race #6 that will be triggered at that time… . Thank you dear team once again for your co-operation on the grandiose project that projects so much grandeur and thank you PTB8 and your guardians and mentors for making the building process cement for us such a smooth and enjoyable experience.. I remind u again, it’s a sure bet that several of us will indeed be called back into 3d and 4d at that time to gaze again in awe on our mathematically precise manifestation and it’s also a sure bet that our friend the sphinx will be well and truly weathered by then, having undergone many interesting face-lifts in the meantime..
tomorrow we’re all on 1 trek’s vacation … bon voyage.. Here are a short summary of the 5 root races so far with their biblical symbols. Each race and nation has their specialities, virtues and weaknessses. The idea is that we all get to try out all the main racial and national types and by showing low tolerance to certain races means that we will remain stuck in those very races / nations we look down on, until we learn the necessary tolerance. In other words learning tolerance is a matter of trial and error until we can work out cause and effect… as we despise certain racial types, so too shall we be despised in later lives probably by those very same racial / national types that we have despised formerly. each COURSE of stone from 21 until 42 represents the 21 COURSES on our human syllabus. the COARSER [thicker] the stone course we’re currently working on, the COARSER is our experience. the LIGHTER the stone course, well the lighter teh load we have to bear in our earthly experience. 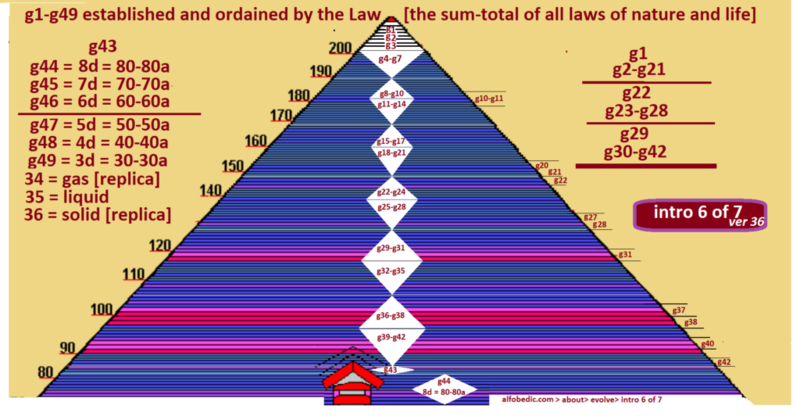 3a) are we going to fine-tune our love of unity to limit it to the love of solely our own powerful bloodline and use our secret knowledge to bolster our wealth and power. 3b) or will we choose to fine-tune our love of unity to encompass all the natural kingdoms, mineral, vegetable, animal and human and in so doing make frequent contacts with the 6d-elites working behind the scenes. 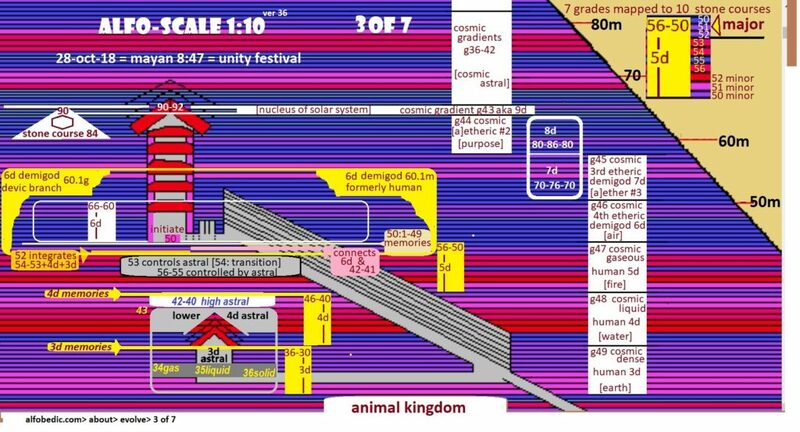 The entrance to the pyramid is on level 19-20, symbolic of the 20 amino acids – the building blocks of the human organism. The downward passage turns into the upward passage on stone course 4, the symbol of a doorway – the fourth letter of the alphabet. the roof of the astral chamber coincides exactly with the topmost astral level [course 34-35]. the roof consists of 7 corbels. the angle of the slope of the grand gallery is 26.2777 degrees. Each dimension divides into 7 and each sub-dimension divides into 49 giving 7 * 7 * 7 = 343. There are 777 levels of consciousness in the human spectrum of the 21 courses. Each of the 10 strings of the wark has 7 spirallae and 4 of those are activated. This ties in with the 28 divisions alog the gradient of the grand gallery. the side wall of the diploma chamber [king’s] comprises of 5 granite blocks each weighing between 50 and 70 tons. Each of these are cut with laser-like precision, where the thinnest sheet of a4 paper would not slide between the stones. 5 symbolizes the 5-fold composition of man: 1) our causal [lux] vehicle, our triad [castor] vehicle, our mental vehicle, our astral-emotional vehicle and our etheric-physical vehicle aka our visible organism and its aura. I recommend you to study the charts above and as you proceed refer to these 5 pages of notation and also this cross-reference chart. You will see how we use a numeric suffix and or prefix to delineate a certain level of consciousness. notation alfo-D =3d, 4d, 5d…. Here we use the granite stone levels as an absolute # with the prefix k. The stone levels start at 0 all the way up to 203, where the typical human range of experience lies in the spectrum k21 to k43. 1) as a model of the earth … using a scale 1:432,000 accurate to within 100 meters which is the same level of accuracy that we can achieve today . That’s because solar winds can effect the speed of earth minutely and the phases of the moon and sun alter the circumferance of the water around the earth. The bottom line is that in half a second the earth traverses in space the distance of 1 of the sides of the pyramid. That also means in 2 seconds it traveres a distance equal to the perimeter of the 4 sides and all that measure with at least as good as accuracy as our best scientist can achiev today. I suppose it was an easy decision to choose one side to equate to half a second. A quarter second would not be so impressive to the 20th century human, and 1 second would just be too outlandish and too unwieldy for the limited resources available. With awe and gratitude, i salute the master-masons for their patience in leaving us such a mesage even though they did provide a decoder’s manual. Thank you master-masons for your message given over a vast expanse of time encoded with a vast expanse of knowledge, wisdom and aga’pe. Thank you master-masons for your meticulous attention to detail…. Designed to withstand tzunamis, pole shifts and solar storms. Thank you so much, dear readers, for coming this far with us and particiapting in the discovery of a most captivating message that can turn out to be so relevant to our present-day and future evolution. Are we going to continue the slow jog-trot of evolution or perhaps move over into the fast lane courtesy of our atlantean master-builders. If u have any questions, feel free to contact us via the contact form.